Outdoor writer, Jack O’Connor, would have enjoyed high country mule deer hunting on the licensed national forest concession of John and Jacob Berger, owners of Mule Creek Outfitting in Wyoming. In fact, maybe he once did hunt there! After all, for decades he hunted all of the western states during his long prolific writing career. I grew up reading Jack O’Connor’s stories of hunting high country mule deer on horse back. Jack was the most important outdoor writer of his time and to me he was the ultimate authority on this subject. I dreamed of someday emulating his style of horse back high country mule deer hunting. Well, on this horse (and mule) based trip I got to live my early dream. The style of hunting was to get up high, glassing down into the sides of bowls and the edges of heavy timber. The idea was to see these deer early mornings while feeding in the unusually green grassy areas before they head back to their bedding areas, and in late afternoon to spot them shortly after they enter these same feeding areas. Shots could be as long as any long range hunter wanted. To me, hunt trip success is determined 50% by the beauty of the land and 50% by the hunt experience itself, including the persons I spend time with on the hunt. I see the land through the eyes of a serious outdoor photographer. I’ve hunted in many of the western states plus Alaska and Mexico. And this land is spectacular! More than any I have hunted before. As I see it there are many places where you can go to shoot stuff. Why not choose from the prettiest land out there? I met John and Jacob at a Deer Expo in Wisconsin 2 years ago and then again this past spring. We three enjoyed great Mexican restaurant meals twice. I could see the twinkle in John’s eyes when we talked about the beautiful national forest land he shares with hunters like me. Jacob, Shawn and Joe. Three great guys to spend time with. John has an interesting “day job”. He is a physician specializing in nuclear medicine. He is part of a large group practice and has always been able to arrange to have off quite a few weeks in fall to fuel his passion. What a dream! John had hunted the western mountains with his own string of 9 horses and mules for 20 years. In those earlier years John hosted friends and family on small group hunts using the same kind of camp equipment as on my hunt with him. So it was no stretch when John and his son, Jacob, bought an existing US Forest Service licensed hunt concession in 2010, a very successful year for his first paying hunters. 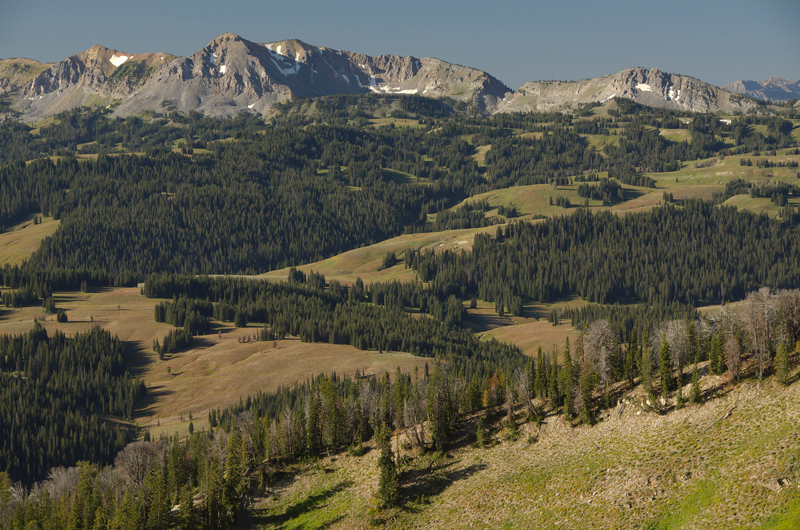 This area of the Bridger mountains has been successfully hunted for many years. Black bear, elk, mule deer and moose are there for the taking. Antelope are hunted just a few miles away on flat land areas of leased private land and BLM land. My hunt was for the second rifle week. The deer hunters in camp the prior week went 4 for 5 on very nice bucks with the fifth hunter passing on several deer that would have been the largest in camp. He was holding out for something larger than what was already on his walls at home. John and Jacob’s hunts are held in the Bridger Forest west of Pinedale, Wyoming. I met the group at their utility building just east of the mountains. Tom Young from LRH had exchanged emails and phone calls with me so I felt I already knew him. He turned out to be as nice as I expected. I'd hunt with him again anytime!